Under the Trump administration, the number of immigrants detained by the US government has skyrocketed. Nearly 75% of those detained are held in private prisons, whose stock prices have soared against the backdrop of Trump’s zero-tolerance and family separation policies. However, private prison companies are not the only corporate actors being enriched. 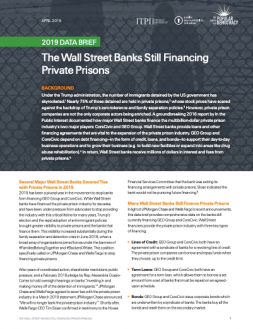 A groundbreaking 2016 report by In the Public Interest documented how major Wall Street banks finance the multibillion-dollar private prison industry’s two major players: CoreCivic and GEO Group. Wall Street banks provide loans and other financing agreements that are vital to the expansion of the private prison industry. GEO Group and CoreCivic depend on debt financing—in the form of credit, loans, and bonds—to support their day-to-day business operations and to grow their business (e.g. to build new facilities or expand into areas like drug abuse rehabilitation). In return, Wall Street banks receive millions of dollars in interest and fees from private prisons. Download the report to learn more.